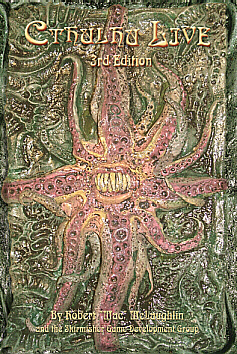 Cthulhu Live is a set of theatre-style larp rules for telling tales of the Cthulhu Mythos. It is based heavily on the Call of Cthulhu tabletop rpg. The rules are heavily based on the Call of Cthulhu tabletop rpg. Characters are generated by purchasing statistics, advantages and disadvantages, and skills. Cthulhu Live is unusual in that there is no random element to resolution. Skill tests are resolved with an absolute test of stat x skill against a hidden difficulty number. Sanity tests are resolved by comparing the character's sanity level to the threat, and dropping them a level if required. Combat is resolved abstractly, and automatically inflicts damage unless countered by an appropriate skill. There is a simple experience system for campaign play. This page was last modified on 9 June 2015, at 23:59.